Airdyne Aerospace Inc. | THE PHILIPPINE AIR FORCE FINALLY GOT A PROPER MARITIME PATROL AIRCRAFT - Airdyne Aerospace Inc. Finally, after a lot of delays and roadblocks along the way, the Philippine Air Force (PAF) can now really say that it got itself a proper Maritime Patrol Aircraft. This is after decades of not having one in its inventory. A photo from Philippine Plane Spotters Group (PPSG) revealed the modifications made on one of the PAF’s Lockheed C-130T Hercules heavy tactical transport aircraft, which was seen with a protrusion near the rear paratroop door, and an oversized door glass in it. The PAF’s C-130T with tail number 5040 was seen in Mactan-Cebu International Airport with what appears to be a SABIR system and a sensor pod on the starboard side. Cropped from original photo by Darvs Bautista, posted at Philippine Plane Spotters Group (PPSG) Facebook page. In its Facebook community page, MaxDefense made an initial assessment that the photo is an evidence of the delivery and installation of the Airdyne Aerospace Special Airborne Mission Installation and Response (SABIR) system, with possibly an Electro-Optical Infra-Red (EO/IR) module in it. It appears that we are partially righr in this. MaxDefense was also able to obtain another photo of the same C-130T aircraft with the SABIR upgrade and a mission sensor pod attached to it. 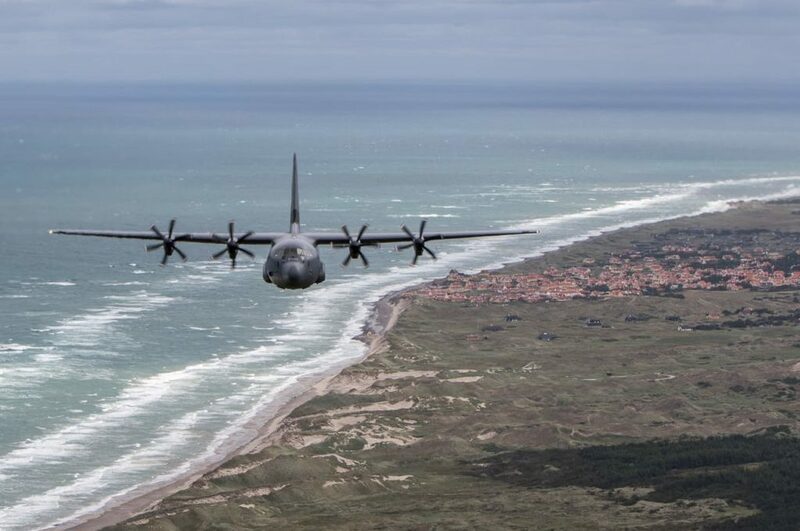 The same C-130T with tail no. 5040 can be seen here again with the same SABIR upgrade and a sensor pod attached to the retractable arm near the paratroop door. Photo provided by a MaxDefense contributor who wish to remain anonymous for PERSEC reasons. The delivery of these upgrades for the PAF’s C-130 was born out of a commitment made by the former US Pres. Barrack Obama to the Philippines in 2015 as part of the US Maritime Security Initiative. Among the programs allocated for the Philippines was the delivery of a palletized Intelligence, Surveillance and Reconnaissance (ISR) kit for use on then recently-acquired C-130T Hercules transport aircraft, under a package which was estimated to be worth US$8.7 million. While other parts of its commitment were partially or fully completed, the ISR kit appears to be the last to be realized, with this specific kit seen on PAF C-130T Hercules with tail number 5040 said to have arrived in the Philippines for installation only several weeks ago. The US military made use of the Canadian-built SABIR system, that allows the mounting of modular pods externally without the need for modifications on the airframe except for the rear paratrooper doors. It involves the replacement of the standard rear paratroop door into a SABIR AS-6 door panel system with an oversized bubble window which allows a wider view of the outside by an observer. It was also designed for a seating observer which can swivel the seat between the door panel and the T-4 computer control workstation positioned nearby. There is an option also from Airdyne to allow the dropping of sonobuoys for submarine detection although the PAF may not have included this in its system. But it can always be an option in the future. Some of the mission pod options that can be used by the SABIR system. Photo from Think Defence UK blog page. The module also includes a retractable arm (AS-7) with a standard ejector rack ready to accept different kinds of modular pods including ISR equipment like EO/IR systems, radars, intelligence equipment (COMINT, SIGINT and ELINT), among others. Mission pods can easily be installed or removed while the arm can be retracted to a minimized position during mission changes or when not needed for use once the aircraft is being used for usual transport duties. All this can be made within less than 2 hours as confirmed by a source with the PAF. The typical components of the SABIR system which is the same as what the PAF uses. Photo taken from Think Defence UK blog page. In the case of the Philippine Air Force C-130T, several systems were installed to convert the aircraft into a dual use surveillance/maritime patrol – heavy tactical transport platform. Both port and starboard side rear paratroop doors were replaced with the SABIR AS-6 door, including the installation of the SABIR AS-7 retractable arm. Each arm carries an ISR equipment, one with an L3 Wescam MX-15HD EO/IR turret for day and night visual surveillance, detecting heat signatures, for target tracking, for video and photo recording, among other capabilities. The PAF system uses am L3 Wescam MX-15HDi EO/IR system. Above photo shows a typical configuration of an MX-15 system which provides high definition day and night imaging. Credits to owner of the photo. This configuration is similar to what the PAF uses for the EO/IR pod, except for the actual model of EO/IR which in the PAF’s case is the smaller L3 Wescam MX-15HDi system. Photo taken from Think Defence UK blog page. The other arm carries a large circular pod with an Israeli-made Elta ELM-2022 synthetic aperture surveillance radar which allows the aircraft to detect surface or ground targets with a range of 200 nautical miles forl ships. This is the pod visible from the photo shared in PPSG’s page. The PAF uses the Elta ELM-2022A maritime surveillance radar for the SABIR-equipped C-130T. The panel antenna is small enough to fit in a encased dome pod as seen on the photo from PPSG. Photo taken from Elta’s website. Both sensors are connected to modular control computer consoles operated by men of the 300th Air Intelligence and Security Wing, while the aircraft is flown by pilots from the 220th Airlift Wing. A Satellite Communication (SATCOM) / Line of Sight system, as well as military radio communication systems are also installed on the aircraft to allow the crew to communicate with other ground, naval or air units or stations. Two T-4 workstations are available for the operation of the surveillance radar and EO/IR system. A typical layout of the SABIR system. The one used on the PAF’s C-130T is essentially the same except for the sensor pods used. So far, sources confirmed that there is only one of the PAF’s C-130 that has this upgrade, although we believe another set could be provided by the US to be installed with the other C-130T of the PAF. This upgrade is said to be the easiest, least costly alternative in the market at the moment, and the US might even be willing to provide more sets for the PAF in the future, this despite the PAF acquiring real Maritime Patrol Aircraft under its stalled Long Range Patrol Aircraft (LRPA) acquisition program. Apparently it took several weeks for the upgrade works to be made, including maintenance works done of the C-130T. To cover its absence, the PAF’s C-295 fleet was put to good use in providing logistics support to the AFP. All works were only done locally at Benito Ebuen Air Base in Mactan, with minimal foreign assistance. Training of operators and maintenance crews are said to be ongoing, although the PAF has an experience advantage with the L3 Wescam MX-15D EO/IR system due to it being used in their Cessna 208 Grand Caravan ISR aircraft also provided by the US government through military assistance program. The PAF is also said to be interested in making use of the platform for Electronic Intelligence (ELINT) and Signal Intelligence (SIGINT), as well as Communication Intelligence (COMINT) missions by using specific mission sensors that can be acquired by the PAF in a latter time. This is actually related to the overall C4ISTAR build up of the Armed Forces of the Philippines, considering SIGINT and ELINT capabilities are being sought after as well by the Philippine Navy and its Naval Air Group, which wanted to utilize its existing fleet of Beechcraft C-90 King Air for such missions. MaxDefense believes that the PAF should have considered using the larger MX-20 EO/IR system which was designed for larger aircraft like the C-130. The MX-15, in MaxDefense’s opinion, is small and is better equipped on smaller aircraft like the Cessna 208 Grand Caravan or the upcoming OV-10G+ Combat Dragon II Broncos. With the modifications expected to be visible always, MaxDefense expects more photos of the aircraft to be posted online as taken by various amateur and professional photographers or plane spotters. Expect MaxDefense to also make more updates on this project, or if there will be any follow-on deliveries or related news on this.